Brief Synopsis: A meeting between Guy Gardner and Mary Marvel leads to much trouble. The bar that Guy Gardner and Blackguard are opening will be called the Dark Side. This name was previously used for a super villain bar seen in Justice League America #43. Guy Gardner has experience operating bars, having run his own, Warrior's, for several years. Though L-Ron doesn't believe him, Guy Gardner was indeed once a lawyer in the days before he was a Green Lantern. 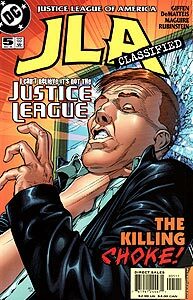 In Maxwell Lord's flashback of the events occurring between JLA Classified issues 4 and 5, Booster Gold and Blue Beetle II had held back Fire after Guy Gardner touched Mary Marvel in an "inappropriate manner," to borrow Mary Marvel's description of the situation. While Booster has an impenetrable force field, having the human Beetle restrain a being of living flame is probably not a wise move. Blue Beetle and Booster Gold have traveled to the Justice Society of America's headquarters in Gotham City in order to recruit Power Girl for the Super Buddies to replace Captain Atom, who has quit the team following the disastrous events of the Formerly Known as the Justice League mini-series. Maxwell Lord mentions that Captain Atom is suing the team for undisclosed damages. Angered by the lack of respect that he is being shown by his teammates, Booster threatens to become a super-villain. It is exactly these feelings of loneliness and rejection that previously drove Booster to temporarily give up super heroics (in Booster Gold, Vol. 1, #25) and quit the Justice League (in Justice League America #37). Booster compares himself to the Joey Bishop in the Justice League version of the Rat Pack. The Rat Pack was an informal collection of music and recording stars in the 1960s that often congregated around Dean Martin and Frank Sinatra. Joey Bishop was a comedian and television star of moderate popularity (and talent) that portrayed the role of straight man for many Rat Pack performances. Many felt hung around the Rat Pack for the shared glory from the larger stars. On the up side for Booster, Bishop outlived all the other members of the Rat Pack. After breaking into Dr. Fate's room in the JSA headquarters, Booster unintentionally delivers the Super Buddies to Hell by way of a mystical device. The Super Buddies consigned to the underworld are Blue Beetle, Booster Gold, Elongated Man, Fire, and Mary Marvel. Boosterrific Review: Make no misunderstanding, JLA Classified is not an action-adventure, it is a character-study generated for comedic purposes. Fortunately for us readers, these familiar characters provide plenty of conflict and opportunity for comedy without too much distortion of their well-established personalities. With this much laughter, who cares about the lack of action? This issue is one of my favorites because you get to see that Booster isn't all that much of a joke. In the span of just a few minutes of his Super Villain career, he manages to do what no other SV has ever managed. Sent the JLA to Hell. The art is also very good in my opinion. Interesting as Booster reveals a bit about himself here and laughs ensue.